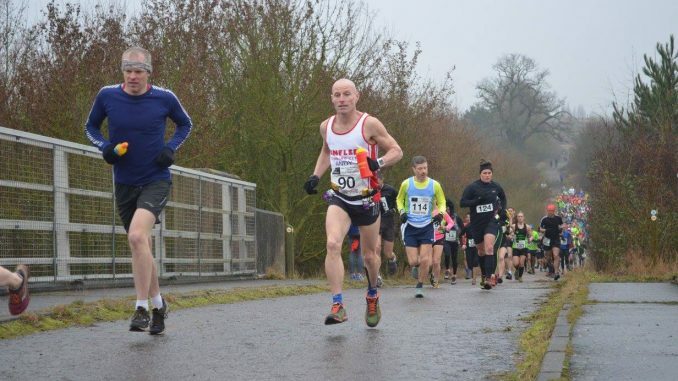 Another fantastic result for Andrew Low of Benfleet Running Club, continuing his great form by coming first at this year’s Flitch Way Marathon. Following the path of a disused railway line Low paced himself well at the start sitting in the lead pack. When the pace increased Low edged into the lead and stayed ahead building a nine minute over the second place runner with a finishing time of 2:58:50.2. Graham Booty continued the Benfleet RC success by completing the 26.2 mile course in 8th place with a time of 3:27:57.0. Next red and white to cross the line was Stephen Burton who was 2nd in his category with a finishing time of 3:45:13.2. Barry Key put in a fantastic time for Benfleet RC in 4:01:33.1, Mark Cowan completed his forth marathon of the week in 4:10:36.2, while Daniel Lyons finished strongly in 4:25:00.8. The Benfleet contingent was rounded off with last minute entrant Simon Davies who finished in 5:03:01.9.